As Summer approaches, Spring's bright white clouds blow away, allowing the golden rays of the sun to warm the forest floor. Time for waterfalls, back-pack lunches and the occasional sighting of deer or bear. The sun shines down on the village where people stroll through the quaint shops filled with the work of local artisans. Dressed in shorts and t-shirts they visit art galleries and stop for an ice cream cone. The days are warm but seldom does the temperature climb above the 80's. The air is clean and there's plenty of time to enjoy it. Time to camp in one of nine campgrounds or at one of 15 organizational camps, time to picnic and fish at Jackson Lake or time to hike. 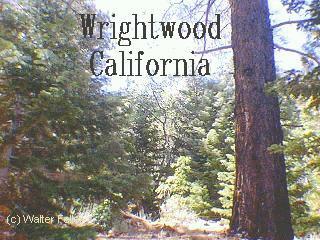 Wrightwood is a popular stopover along the 2500 mile Pacific Crest Trail extending from Mexico to Canada. Several other trails offer terrain from the desert up to over 9,000 foot elevation, hikes of a couple hours or a couple of days. Summers in Wrightwood are rich with activity. Within 16 miles of the village you'll find everything from the tranquility of a tour through Saint Andrews Abbey or gliding at Crystalaire to the exitement of high speed water skiing or serious sport fishing at nearby Silverwood Lake.